Lists of frequently asked questions about Cloverleaf Analytics solutions and capabilities. Does Cloverleaf Analytics have pre-built Reports? Yes, Cloverleaf Analytics comes with more that 120 pre-built insurance reports, ranging from Premium Bordereaux and Premium Retention to Loss Triangles and Schedule P reports. We are always expanding our product and adding new reports frequently. Can I create my own calculations or formulas for reports and dashboards? 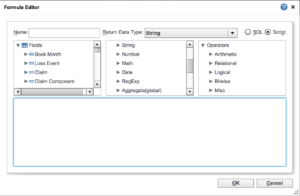 Yes, you can create formulas using our fully documented intuitive formula editor. Can I edit the pre-built reports? 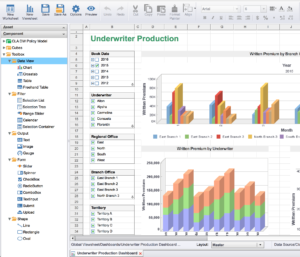 Yes, unlike the other BI solutions on the market, you can edit the pre-built reports right through the web. There is no need to install a desktop tool or write MDX or SQL statements. Can I schedule reports to be run and e-mailed to me? Yes, you can schedule reports to be run at anytime, output in any number of formats and e-mailed to as many people as you like. Advanced scheduling allows you to have multiple schedules and even wait for other processes or reports to finish before running the report. You have full control. Can alerts be generated and sent to me? Yes, you can schedule any report to be triggered as an alert. You set the logic that causes the alert and if it is triggered the report will be immediately generated and e-mailed to you or others you designate. An example is our Large Loss Detail report. You can schedule it as an alert, setting the large loss threshold, say $100,000. When a claim crosses the $100,000 threshold for incurred it will be triggered as an alert and a report outlining the details of that claim would immediately be sent. We have a network printer. Can I print my reports directly to it? Yes, you can attach your network printer and print any report to it. You can even schedule reports to be printed to the network printer automatically. Can I report on data from outside Cloverleaf Analytics? Absolutely! You can connect to other databases, web services and even Excel files and report on them. See the section on Mash-ups for frequently asked questions about how you can combine external data with your insurance data and report on it. 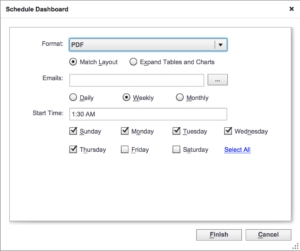 Report bursting is a way to greatly improve the speed and efficiency of report distribution. The scheduler runs the report creating a dataset for all those the report is to be distributed to. It then generates the output and e-mails it to the intended recipient. Here is an example: The Upcoming Renewal report is scheduled to be bursted out to all 400 agents each month. Instead of running the report 400 times, once for each agent to produce their list of renewal policies, Cloverleaf Analytics runs the report once retrieving all the policy data for the 400 agents and then creates the 400 PDFs and e-mails them out to each agent with their list of policies. In this example this improves performance dramatically by only running the report once instead of 400 times. I want to embed reports into my portal. Can I access reports via web services? Yes, you can access all the reports from web services or API calls, allowing you to fully embed the report right into your portal. You can control the filtering and the output (PDF, Excel, HTML, etc.) so your end user gets exactly what they need. Do I have to have a desktop tool to create reports? No, you can create reports and visualizations right from your web browser. There is no need to install a desktop tool. Can I add my own filters to reports? Yes, with our intuitive filter builder you can add filters on the fly and even create advanced conditions. You can also add parameters and select the values you want each time you run the report. It says reports are interactive. What does that mean? ETL (Extract, Transform and Load) is a process responsible for pulling data out of source systems and moving it into a target system. In the case of Cloverleaf Analytics the target is the ODS (operational data store) and data warehouse. How do we load data into Cloverleaf Analytics? 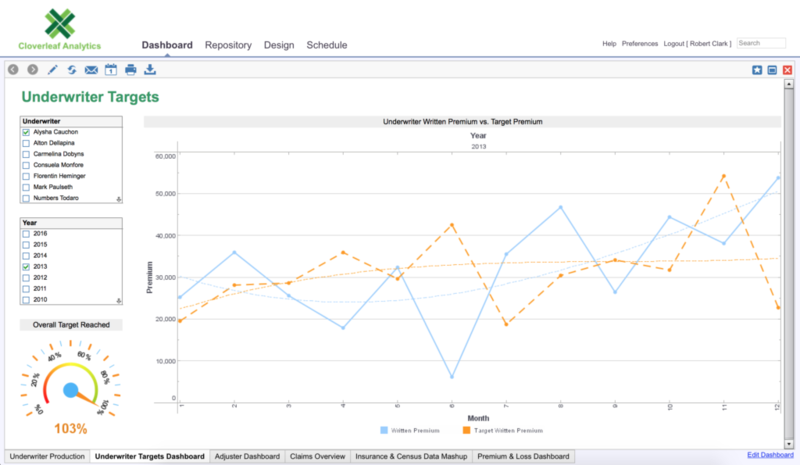 Load the data into the data warehouse, calculating insurance KPIs during the process. Instead of extracting data to files, can we load data directly to Cloverleaf Analytics template database? Absolutely! 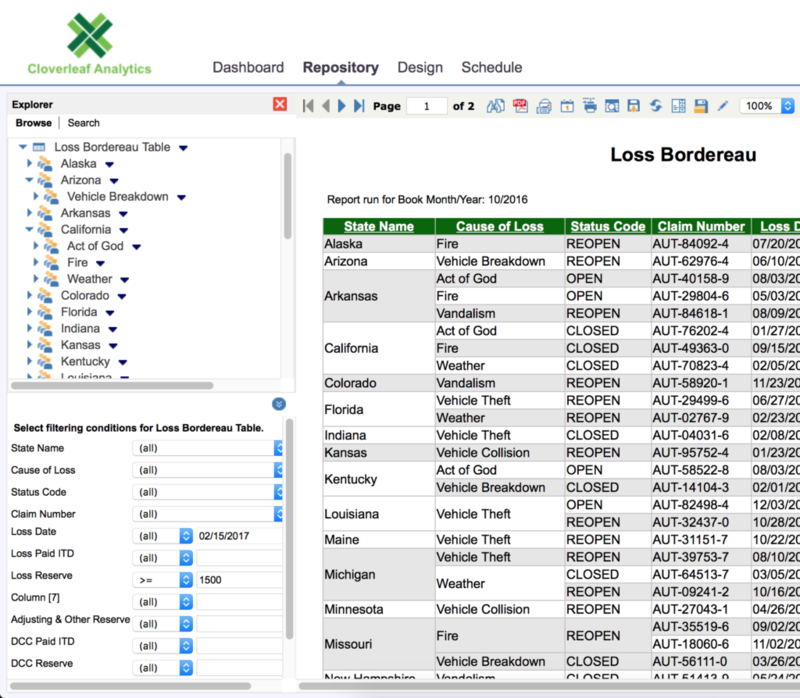 We encourage loading data direct to the Cloverleaf Analytics template staging area. This is a faster movement of the data from the source system to Cloverleaf Analytics then through flat files. All the powerful validations and business rules that come with Cloverleaf Analytics are run against data in the tables just as they are with the files, so you can be confident in the integrity of your data. Can we load data from more than one policy or claim admin system? Yes, we built Cloverleaf Analytics to be loaded from as many different systems as you have. We have built in code translations and calculations to handle conforming data from multiple systems into a uniform dataset to give you the best analysis across all your systems. We are not owned by a policy administration system vendor, like other solutions, so we are not tied to one system, but are open to all. Each of our systems have different codes for the same field. How does Cloverleaf Analytics handle this? Cloverleaf Analytics has code tables in Excel that are built specifically for this purpose. You can specify the code coming from each system and the uniform code you would like in the ODS and Cloverleaf Analytics will do the work for you. Can I add my own fields to Cloverleaf Analytics? 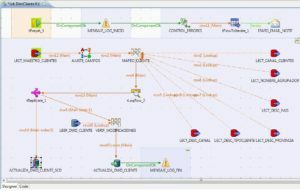 Do I have to edit the ETL process like the other BI solutions? Absolutely, you can add your own fields! 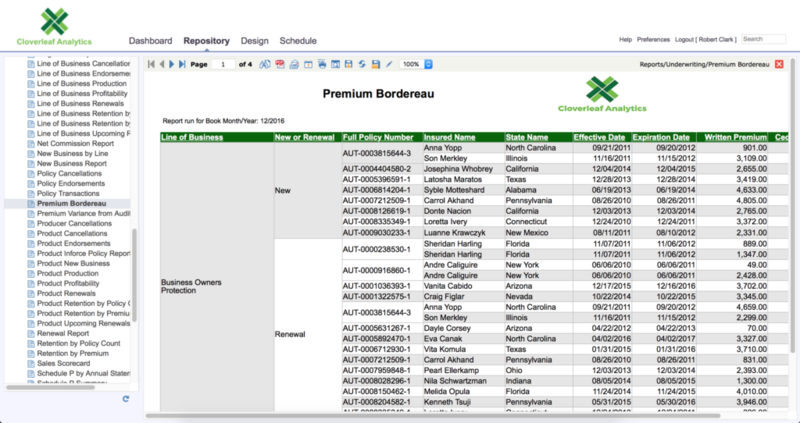 Cloverleaf Analytics has template tables that have all the fields that are loaded into the system. To add new fields you simply add your new field, it’s data type and description to the appropriate template spreadsheet and the Cloverleaf Analytics ETL process will automatically add it to the database for you. You don’t have to edit ETL processes like other systems, nor do you need to modify the database. Cloverleaf Analytics takes care of updating the database and loading the data for you. Does Cloverleaf Analytics perform validations on the data we are loading? We work closely with our customers and their data and continually add new business rules and validations to ensure the quality of the data being loaded. If my data does not pass validations how do I get notified? When validation errors are found in the data, Cloverleaf Analytics ETL sends an e-mail with an Excel attachment that has all the issues listed along with a detailed description of the error and an example record with the problem. You can configure the e-mail to go to as many recipients as you want. Can I add my own validations without modifying the ETL? Absolutely! 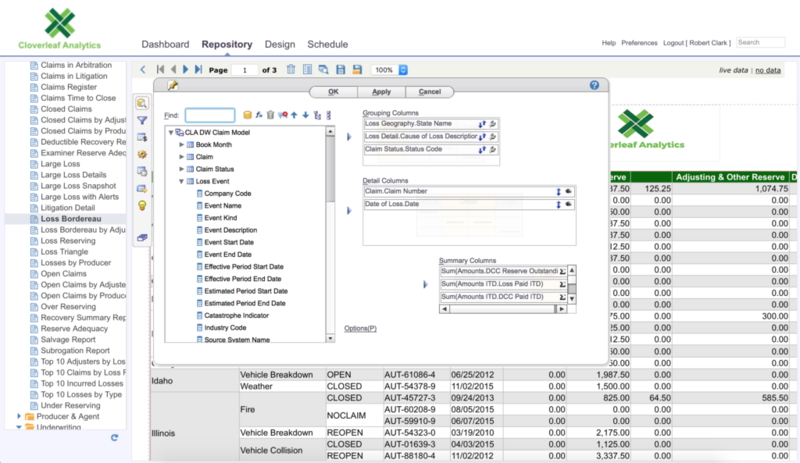 We use a business rules engine that allows you to add your own rules via decision support tables built in Excel or visually design rules through our web interface. No need to modify ETL processes or do any programming. Does Cloverleaf Analytics have a staging area? Yes, we have a staging database that contains the template data tables. The data is loaded into the staging area where it is validated before being loaded into the ODS an data warehouse. Other BI solutions require us to manually balance the data. Does Cloverleaf Analytics have an automated balancing process? Yes, Cloverleaf Analytics has an automated balancing process for both the detailed and summary data being loaded. This allows the system to ensure that the transaction level data balances as well as the point-in-time numbers like ending reserves and earned premium. Does Cloverleaf Analytics come with pre-built dashboards? 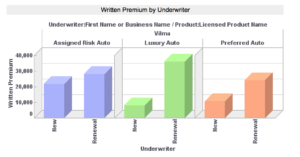 Yes, Cloverleaf Analytics comes with pre-built dashboards and scorecards for underwriting, claims and trending analysis. Can I edit the pre-built dashboards? Do I need to do programming? Can I create and edit dashboards via the web? Absolutely! Just as you can edit the pre-built dashboards, you can create your own with our powerful drag-n-drop designer. Simply drag the data and visualizations onto your dashboard and within minutes you will have a sophisticated dashboard without any programming. Can I export a dashboard? You can also export the underlying data, of any component on a dashboard, to Excel with the simple click of a button. Can I e-mail a dashboard to someone? Absolutely, you can click the E-mail button to e-mail a dashboard to someone else. You can choose an export format (Excel, PDF, PowerPoint, etc. ), whether you want to include a link back to the dashboard and the e-mail addresses. If you would like to e-mail the dashboard on a regular basis you can schedule it. See “Can I schedule dashboards to be exported and e-mailed?” below for an explanation. Can I schedule dashboards to be exported and e-mailed? Can I annotate or add comments to a dashboard? Yes, you can add annotations to any component on the dashboard. This gives you a powerful way to interact socially with others by each adding your annotations to a dashboard and doing collaborative analysis. Can I save my selections on a dashboard? Yes, we call these Bookmarks. You can perform all your selections and drill down paths on a dashboard and then save them as a Bookmark. When you return to the dashboard you can select the Bookmark and it will automatically apply the selections and drill downs for you. Can I view and interact with dashboards on mobile devices? Yes, you can view and interact with your dashboards on any mobile device. You can even specify the layout of how you want to see it on a mobile device. 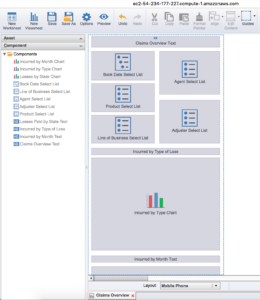 See the question “Can I change the layout for how a dashboard is viewed on a mobile device?” below. Can I change the layout for how a dashboard is viewed on a mobile device? Yes, you can setup your dashboards to have different layouts for different size mobile devices, all by drag-n-drop. You get the same great interactive dashboard capabilities, laid out in a way that is easier to use on smaller devices. Can I drill down in dashboards? Absolutely! 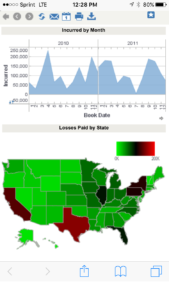 You can drill down into any visualization or table on a dashboard. You also have the powerful ability, via drag-n-drop, to create your own drill down paths on any visualization or table. Can I see the underlying data in a dashboard graph? Yes, you can click on the Show Data button and see the underlying data. 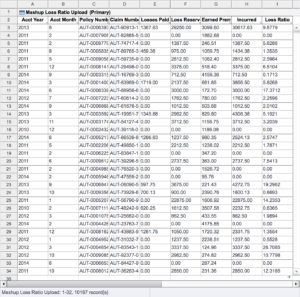 From there you can click the Export button and download a copy of the data to Excel. Mash-ups in Cloverleaf Analytics are data sources created by combining data from different sources. One example would be combining insurance policies with census data to get the average number of members in a household for each homeowner policy. Mash-ups are powerful in that it allows you to join external data in with your insurance data for even more advanced analytics. There is no need to build ETL’s or complex processes to do it. How do I add external data? 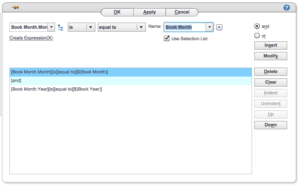 You can simply upload a file (Excel, CSV, etc) through the web or you can connect to a data source such as a relational database (Microsoft SQL, Oracle, etc) or a web service such as Saleseforce.com by defining the connection parameters. Can I import data through the web? Yes, you can upload delimited text files and Excel spreadsheets. Cloverleaf Analytics will automatically parse the data into a table ready to report on or join to other data. Can I create formulas with the mash-up data? Absolutely! You can create formulas, using our intuitive formula editor, with data from multiple sources as though they were from the same source. Can I use a mash-up as a data source to reports or dashboards? Yes, that is the beauty of mash-ups! 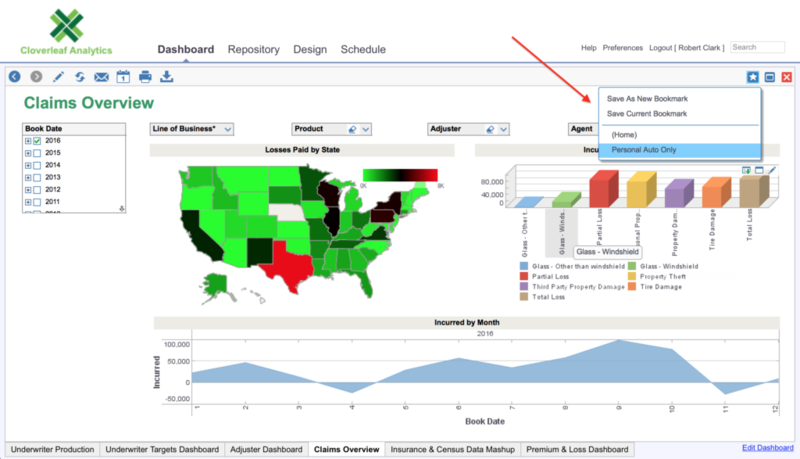 You can create your mash-ups with data from multiple sources and use then as data sources for reports and dashboards. This gives you the powerful capability of joining data from many sources and producing reports, analysis and dashboards. The ways in which you can analyze and visualize your business are limitless. 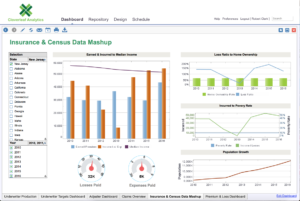 Below is an example dashboard built on a mash-up of insurance data from Cloverleaf Analytics and census data from the U.S. Census Bureau. Can I export the results of my mash-up? Yes, you can export the mash-up values to an Excel file or you can create a report or dashboard and export it in other formats. Can I connect to LDAP or Active Directory Services (ADS)? Absolutely! You can connect to both LDAP and ADS. It’s fully configured through our web based Enterprise Console. No need to edit configuration files buried on a server, like other solutions. 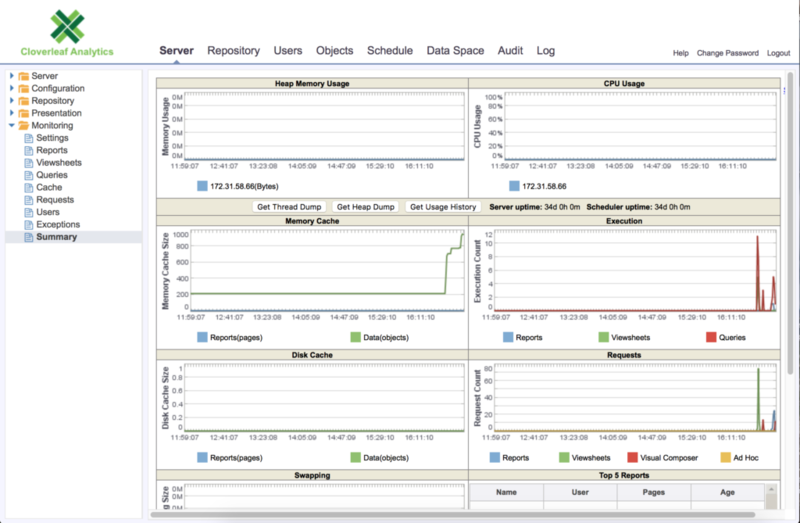 Can I monitor performance and activities on the server? Yes, we have full monitoring of the server, queries, reports and activities. You can see who is on the server and everything that is being processed. Can Cloverleaf Analytics scale for a large company? Absolutely! You can create a cluster of Cloverleaf Analytics servers along with N number of data nodes for grid computing. These capabilities are built right in and allow you to scale by simply configuring our servers through the Enterprise Manager. No need for knowledge of complex grid computing. If your data needs go beyond 100 million records returned by queries you can enable our Apache Spark support and scale to any size by adding as many HDFS (Hadoop Distributed File System) nodes that you need. You don’t need to know anything about Hadoop or MapReduce. We have taken care of it for you. 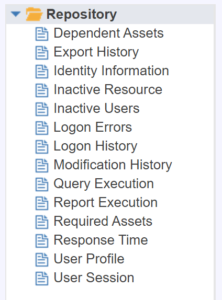 Is there audit logging on reports and data access? Absolutely! All activities, access to data and exporting of data are logged on the server. You can list the activities or query the history to find specific information. Below is a list of some of the auditing categories. Can we secure the data down to the field or the records being accessed? Yes, you can create virtual private models (VPM) where you specify which fields users have access to and criteria for records. In other words you define what data users have access to and can restrict what data gets returned. For example, you can prevent agents from seeing underwriting notes on a policy and restrict them to only seeing their policies and no one else’s. Does Cloverleaf Analytics support "Big Data"? Yes, Cloverleaf Analytics comes with support for Apache Spark with HDFS (Hadoop Distributed File System) built right in. Once you hit the the threshold of around 100 million records, you can enable Apache Spark and add as many nodes as you need to support your data volume. No need to know Hadoop or MapReduce we have all the capabilities built right in. Can Cloverleaf Analytics servers be clustered and load balanced? Yes, the Cloverleaf Analytics server is designed to be clustered and allows you to load balance across multiple servers. This is done simply by configuration. What is an ODS and does Cloverleaf Analytics have one? An operational data store (or “ODS“) is a database designed to integrate data from multiple sources for additional operations on the data. Allowing you to consolidate and analyze transactional data from multiple sources. Cloverleaf Analytics comes with a pre-built class IV insurance ODS built from the Acord Reference Framework and the OMG data models. It includes property and casualty with line of business specific details for all lines including workers comp. 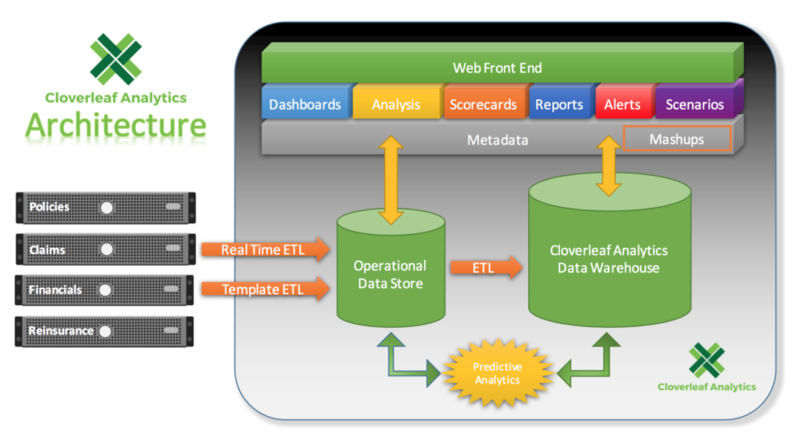 What does the architecture of Cloverleaf Analytics look like? 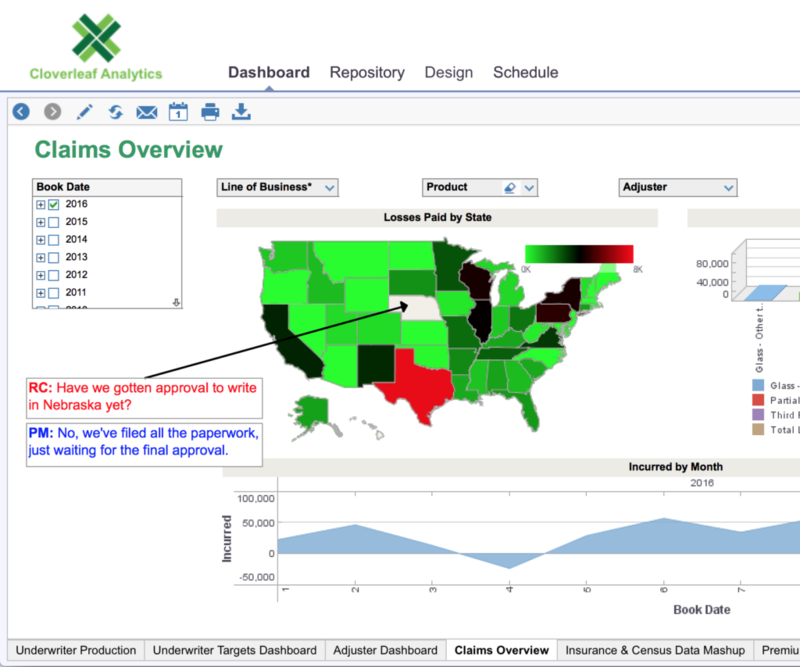 How is Cloverleaf Analytics data model different from other insurance BI solutions? 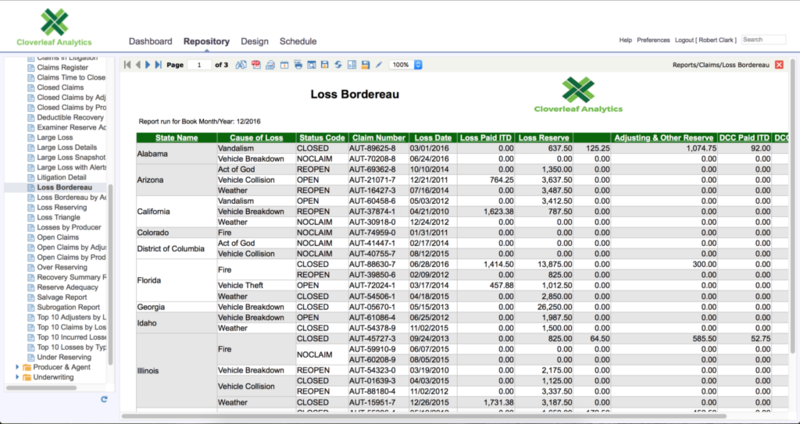 Cloverleaf Analytics includes an ODS and Data Warehouse allowing you to do consolidated operational reporting and analytics. Most other solutions only include a data warehouse so you cannot do consolidated operational reporting. 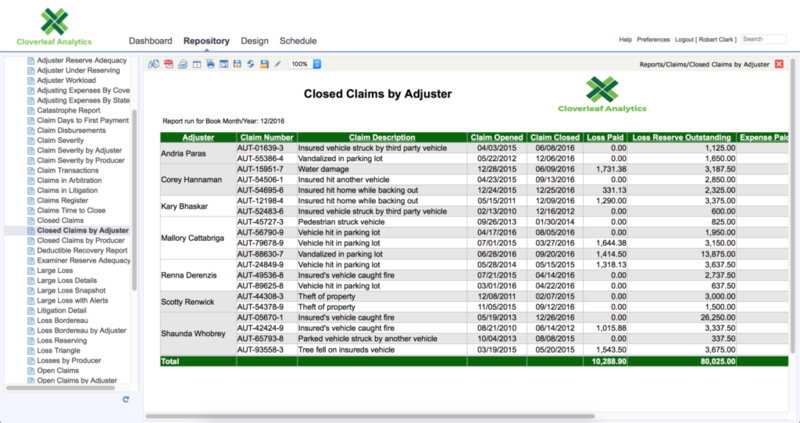 Cloverleaf Analytics is built from insurance industry standard data models (Acord & OMG). Other BI solutions available on the market have proprietary models that they built to be “generic” and lack policy and claim details. 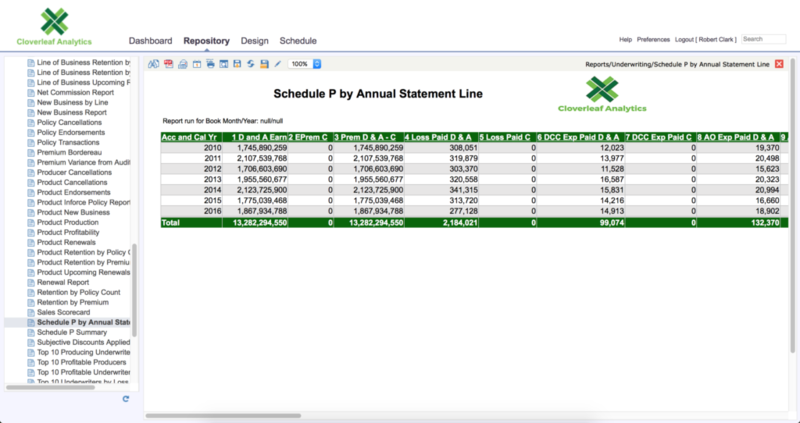 Cloverleaf Analytics includes line-of-business details for all lines, including workers compensation, built into the models. Other solutions are generic and do not include line-of-business details. You have to add them to their model and ETL processes. When doing so, all the line-of-business details are on the same risk or coverage record. This means, for example, that homeowners and auto details are fields on the same risk record. So when populating the fields for a line-of-business (like auto) the other line-of-business fields (like homeowners) are left null and create a “swiss cheese” effect in the records, causing issues in querying data. This is not a problem with Cloverleaf Analytics since line-of-business details are built right in. If you have additional questions, that we have not answered here, please feel free to e-mail (info@cloverleafanalytics.com) or call us at (512) 361-7173. We’re always available to answer your questions.